Female choice and male–male aggression are two modes of sexual selection that can lead to elaboration of male morphological and behavioral traits. In lek-mating species, male mating success is often strongly skewed, and it is puzzling why variation in male traits is still observed given directional female choice. If male traits correlated with reproductive success are honest signals of male quality, there may be survival costs associated with the expression of those traits. In this study, we examined whether morphological, behavioral, and territorial traits are correlated with male mating success and survival in the lek-mating greater prairie-chicken (Tympanuchus cupido). We introduce a novel application of multinomial discrete choice models for analysis of female mate choice behavior. We found that behavioral and territorial attributes showed 6.5 times more variability among males than morphological traits. 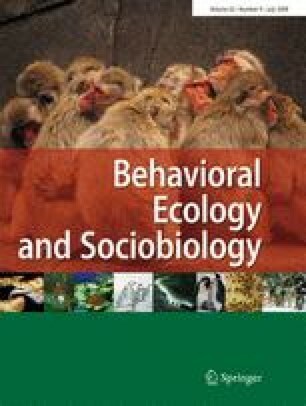 Both display and aggressive behaviors were strong predictors of male mating success, suggesting that both female choice and male–male aggression were important in determining mating success among male greater prairie-chickens. Moreover, annual survival of male prairie-chickens was independent of mating success and male traits. Females appear to be choosing males based on behavioral traits where large variation exists between males (coefficient of variation >30%). Behavioral traits were the most important factor in determining mating success of male prairie-chickens, but the mechanism underlying this relationship is unknown. In the future, experimental manipulations of male hormones or parasite loads could bridge the proximate mechanisms and ultimate consequences of factors mediating male mating success in lek-mating grouse. We thank Thomas Loughin for statistical assistance. Robert M. Gibson, Timothy H. Parker, and two anonymous reviewers gave helpful comments on previous drafts of the manuscript. We thank the following organizations and people for allowing access to their prairie-chicken leks: Konza Prairie Biological Station, a property of The Nature Conservancy managed by the Division of Biology at Kansas State University; Rannells Flint Hills Prairie Preserve managed by Dr. Clenton Owensby in the Department of Agronomy at Kansas State University; and private lands owned by Grant Poole. Tom VanSlyke and Kenny Berg provided logistical support. We thank Tracey Adamson, Jeremy Baumgardt, Amanda Behnke, Jarrod Bowers, Tara Conkling, Seth Cutright, DeVaughn Fraser, Chris Frey, Kyle Gerstner, Chod Hedinger, ‘Hoogy’ Hoogheem, Nichole Lambrecht, and Kara Oberle for field assistance. Funding for field work included a First Award from Kansas NSF EPSCoR Grant, a research grant from the American Ornithologists’ Union, and an NSF Doctoral Dissertation Improvement Grant (DEB-0608477). J. K. Nooker and B. K. Sandercock were supported by the Konza Prairie NSF Long-Term Ecological Research Grant (DEB-0218210) and by the Division of Biology at Kansas State University. The research performed in the present study complied with the current laws of the countries in which they were performed and were conducted under the following permits: Scientific, Education, or Exhibition Wildlife Permit, Kansas Department of Wildlife and Parks (SC-118-2003, SC-068-2004, SC-078-2005, SC-072-2006), and Institutional Animal Care and Use Committee (Protocols 2079, 2351).